The vision of harvesting solar power in space and delivering it to markets from large platforms in Earth orbit has been around for decades. The concept of the solar power satellite (SPS) was invented in the late 1960s by Dr. Peter Glaser. The SPS concept is an elegant solution to the challenge of providing large-scale energy for humanity. A series of enormous platforms would be positioned in space in high Earth orbit to continuously collect and convert solar energy into electricity. This power would then be used to drive wireless power transmission systems that transmit the solar energy to receivers on Earth. Because of its immunity to nighttime, weather, or the changing seasons, the SPS concept has the potential to achieve much greater energy efficiency than ground-based solar power systems, and since its invention, there have been numerous studies and technology projects conducted by various government agencies, companies, and universities that have been focused on the goal of the SPS. However, early SPS architectures were technically complex and unlikely to prove economically viable. There were several reasons, such as low technology maturity; excessive mass, due in part to the need for huge, highvoltage power management and distribution (PMAD); the cost of developing a monolithic SPS much larger than the International Space Station; the need for hundreds of astronauts and thousands of robots for SPS construction in space factories at various orbits; and others. Some of these early issues—particularly regarding technical feasibility—were addressed by NASA’s space solar power (SSP) studies and technology research in the mid-to late 1990s. Unfortunately, 10 years ago a number of key technical and economic uncertainties remained, including poor efficiency of key devices (e.g., amplifiers, photovoltaic cells, etc. ); the need for large-scale and in-space integration of key systems (e.g., PMAD, thermal management, etc. ); inadequate capabilities in space operations (including modest autonomous robotics and extremely expensive astronaut operations); the continuing need for reusable launch vehicles (RLVs) prior to launching an initial SPS; and the lengthy R&D program required for an initial SPS pilot plant (estimated at 20-25 years or more). During 2011-2012, NASA’s Innovative Advanced Concepts (NIAC) program supported a preliminary Phase 1 project to investigate a transformational new approach to the concept of space solar power: SPS-ALPHA (Solar Power Satellite by means of Arbitrarily Large Phased Array). The SPS-ALPHA concept represents a radically different approach. SPS-ALPHA is a biologically inspired architecture, analogous to a hive of bees or a colony of ants-in this case a very large number of mass-produced “small-satellite” class modules will be assembled to form a single enormous platform. 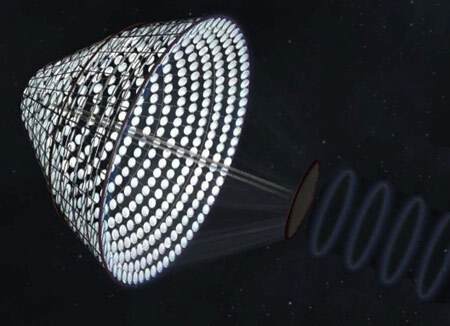 To deliver energy to Earth, SPS-ALPHA would typically be based in a geostationary Earth orbit, where it would intercept sunlight using a collection of individually pointed thin-film mirrors, convert that sunlight across a large radio frequency (RF) aperture into a coherent microwave beam, and transmit the power to markets on Earth or in space. SPS-ALPHA incorporates a number of critical new technologies, including: (1) wireless power transmission using a retro-directive RF phased array with high-efficiency solid-state amplifiers; (2) high-efficiency multi-band gap photovoltaic solar cells, employed in a concentrator PV architecture with integrated thermal management; (3) lightweight structural components, applied in various systems and subsystems; (4) autonomous robotics in a highly structured environment; and (5) a high degree of autonomy among individual modules. However, no “breakthroughs” are required, and the key innovation is at the architectural level. SPS-ALPHA involves three major functional elements: (1) a large primary array that is nadir pointing; (2) a very large sunlight-intercepting reflector system involving a large number of reflectors that act as individually pointing “heliostats,” mounted on a non-moving structure (the “bowl” of the goblet in the figure); and (3) a truss structure that connects those two. As conceived, SPS-ALPHA is not a traditional three-axis stabilized satellite with one or more solar arrays; rather, SPS-ALPHA entails bodymounted (non-moving) solar power generation on a gravity-gradient stabilized satellite, with an axi-symmetric physical configuration. The recently completed NIAC study market assessment found that there are both primary markets and several important secondary markets that could support the future development and deployment of SPS-ALPHA: in particular, that the SPS-ALPHA architecture has the potential not only to make possible the vision of continuously delivering almost limitless solar energy to markets on Earth, but also to transform a range of future space mission applications. During the remainder of this century the demand for commercial baseload power is forecast to grow dramatically in all regions of the globe, with the exception of the developed countries, such as the U.S., Japan, France, and others. In the latter regions, use of electrical power is forecast to increase, but much more slowly, due to ongoing improvements in the efficiency of energy use per unit economic activity. In the longer term, the recent study found that SPS-ALPHA could deliver baseload power at a cost of about 10 cents per kilowatthour. Stepping stones to this far-term vision include both premium niche markets on Earth, as well as the real need for affordable space solar power for in-space applications. Space missions have always been “power paupers”—constrained in design choices due to limited power availability and the high cost of that power. As a result, there are a wide variety of potential benefits that large and affordable space solar power technology and systems—such as SPS-ALPHA—could establish for prospective future space applications. The range of these potential non-SPS applications includes: solar electric power and propulsion for robotic and human exploration missions, power for lunar and planetary surface operations, power for large Earth-orbiting platforms, and systems for future exploration of the outer planets. A broad range of technical challenges must be addressed in order to establish the economic feasibility of SPSALPHA, and, if appropriate, to subsequently proceed with development. However, the hyper-modular architectural approach to space systems embodied by the SPSALPHA concept appears to be technically feasible and may be broadly important for future space missions. A key deliverable from the 2011-2012 NIAC Phase 1 project was a roadmap that presented a credible path forward for SPS-ALPHA and the hyper-modular architectural approach. Elements of this roadmap included: early advanced concepts study projects (including this NIAC Phase 1 project); continuing SPSALPHA and supporting infrastructure concept studies and related advanced technology research projects; ongoing focused technology research and development to realize continued improvements in the efficiency, operating temperature, and mass of key devices (and enable evolutionary commercial viability for large-scale space solar power in terrestrial markets); a regular series of systems-level technology flight demonstrations, targeting design reference missions with strong nearer-term space applications and culminating in a large-scale pilot plant SPS-ALPHA demonstration in GEO; and orchestrated development of supporting infrastructures and derived space applications. If SPS-ALPHA can be developed, solar power from hundreds of megawatts to hundreds of gigawatts could be harvested in space and delivered efficiently and affordably to markets on Earth, and could enable energyrich operations throughout the inner solar system—transforming all aspects of government and commercial space activities. John C. Mankins is president of Artemis Innovation Management Solutions L.L.C.